For the average cyclist, a rack is a rack is a rack. However, I've done enough touring and commuting to become somewhat of a "rack geek," and my favorite new product of the year is the rack that I've just installed on my winter commuter bike. It's not technically a "new" product, just new to me. 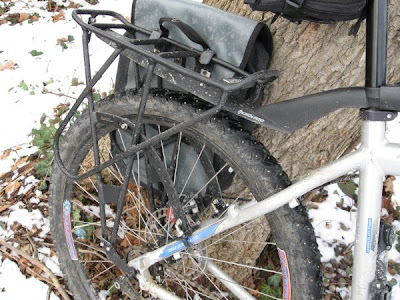 Just about any rear rack can be set up on a standard road touring bike without any issues. However, a mountain bike with disc brakes throws a monkey wrench into the works. There are a couple of disc-specific rear racks available that we've carried in our stores, like the Axiom Journey Disc and the Topeak Explorer MTX Disc. These are decent racks, and they use extensions on the lower mounting tabs to get around the disc brake mechanism. But, depeding on your frame geometry, they don't work 100% of the time, and they still require that your frame have rack mounting eyelets. Enter the Axiom Odyssee Full Suspension Rack. The lower mounting points are attached to your rear wheel quick release skewer, and the upper mounting brackets are clamps that wrap around your seatstays. This makes the rack compatible with virtually any bike, from 24-inch to 700C wheels (I'm curious to test it out on my 29er). The only bike it won't work on is a full-suspension bike that has suspension pivots on the seatstays near your rear dropouts. Available by special-order for $46.99, and it comes with all the brackets, clamps, and hardware you need. Here it is in action on my bike. As you can see, it works great with the Axiom Waterproof Panniers, as you would expect, and leaves plenty of clearance for my big feet.